Union Public Service Commission (UPSC) has released final selection list of candidates against F.1/25/2015-R&S on 29th May 2015 on official website www.upsc.nic.in. UPSC has declared recruitment results against various advertisements of 2013 and 2014. The interview of these candidates has not been possible and the selected candidates are recommended for these posts. 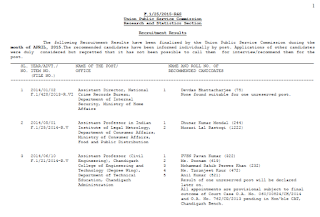 Union Public Service Commission (UPSC) has released Recruitment Results against various advertisements of 2013 and 2014 which have been finalized by UPSC during the month of JANUARY, 2015. 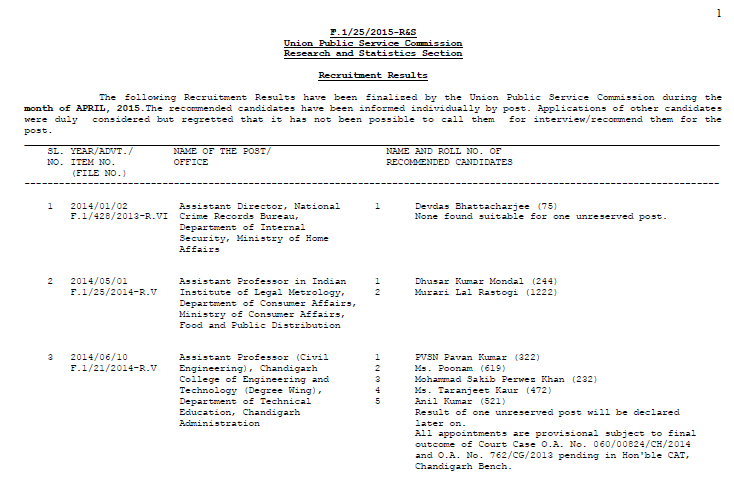 UPSC has released a list of Finally Selected Candidates / Final Result / the recommended candidates for the various posts i.e. Marketing officers Group I, Training Officer (Turner), Associate Professors in Civil Engineering, Assistant Director General / Director Ministry of tourism, Assistant Professor in Mathematics, Assistant Engineer (Electrical / Mechanical Engineering), Agriculture Engineer in Farm machinery training and Test institute, Deputy Director of Flying Training of Directorate General of Civil Aviation, Investigator Grade I, Professor in Agriculture Chemistry, Specialist Grade III, Assistant Professor in Neurology, Pediatric Cardiology, Assistant Public Prosecutor, Assistant Professor in Ayurveda, Deputy Superintending Epigraphist and Assistant Professor in English. These selected candidates have been informed individually by post. Applications of other candidates were duly considered but regretted that it has not been possible to call them for interview/recommend them for the post. These candidates are required to get appointment letter / joining date for these posts.